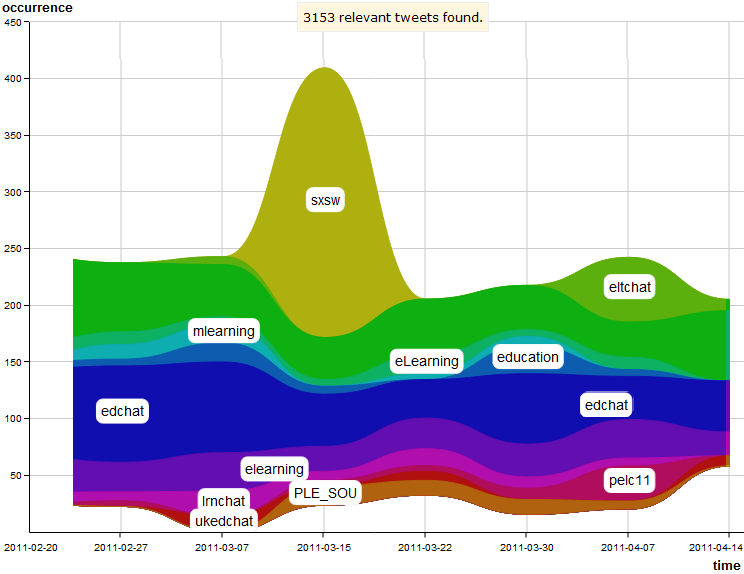 If you have been to a TEL event recently, you might have already seen our Tweet Visualizations in the domain of TEL. Stefanie Lindstaedt will be presenting our paper entitled “On the Way to a Science Intelligence: Visualizing TEL Tweets for Trend Detection” at EC-TEL 2011 on Wednesday Thursday. I thought this was a good occasion to tell you a bit more about the background of the visualizations. I should not forget to mention that the system was built in a joint project between Know-Center and Joanneum Research in the context of the STELLAR Network of Excellence. Most of the stuff below is taken from our paper, if you want to know more, you can access the preprint here. Below you can see the architecture of the system. We developed a focused Twitter Crawler, which takes as input either a taxonomy of hashtags, or a list of users, or both. It then queries the Twitter Streaming API for matching data. This allows for adapting the system to a certain domain. The tweets are logged, cleaned, and informative tokens (such as nouns and hashtags) are extracted using TreeTagger. 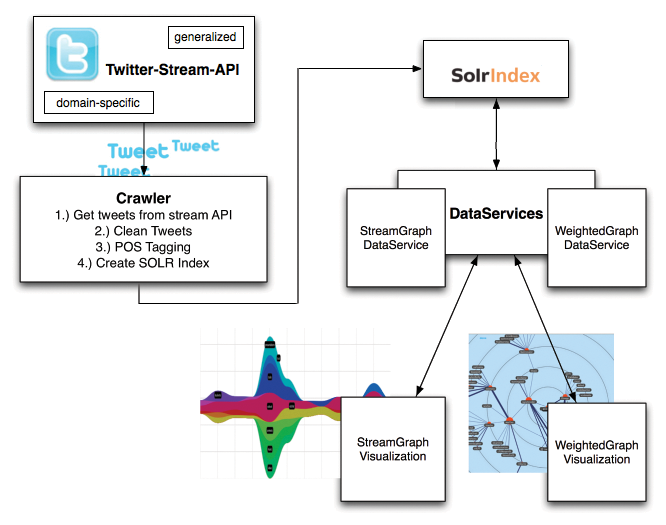 Finally we store the tweets, their metadata, and their associated informative tokens in a Solr index. Therefore, one can access the real-time data, but also go back in time. At the moment, this works only for a couple of weeks, but we are in the process of widening this timeframe drastically. Below you can see the Weighted Graph Visualization for the hashtag of the 2nd STELLAR Alpine Rendez-vous. 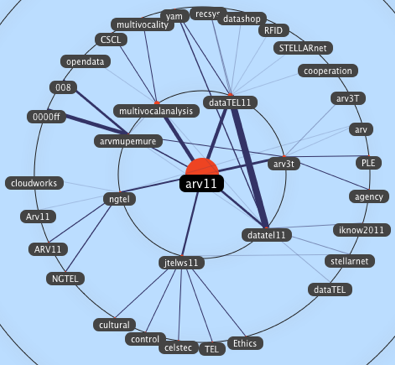 In the center, there is the official hashtag for the event #arv11. The hashtags which are directly related to the event hashtag, are hashtags of individual workshops, such as #datatel11 for the dataTEL workshop, and #arv3t for the workshop “Structuring online collaboration though 3 Ts : task time & teams”. Co-occurring with the individual hashtags are hashtags that describe some of the content of the workshops, such as agency and PLE for the 3T workshop. Due to the fact that the user interface relies on web standards, the visualizations can be easily included in any system that relies on those standards. Apart from the main website http://stellar.know-center.tugraz.at/vis, versions of the visualizations are also available as widgets in TELeurope. We are quite pleased with the reception of our system. The visualizations have been used as a support in the dataTEL workshop (#datatel11), the RDSRP’11 special track at i-KNOW (#rdsrp11), and the SURF Learning Analytics Seminar (#sa_la). Participants liked the look of the visualizations, and the idea behind them. The system will also be employed as a reflection tool in the Workshop on Awareness and Reflection in Learning Networks (#arnets11) at EC-TEL 2011. Nevertheless, there are several issues we still need to address. As already mentioned, we are working on providing a larger index that goes back to 2010. We are also looking into new zooming and filtering facilities, allowing users to dig deeper into the data. Furthermore, we want to integrate different measures to derive more meaningful terms for longer periods. If you want to know more, especially about the evaluations we have already conducted, please refer to the paper. If you want to use the visualizations in one of your events, just contact me. As always, comments and suggestions are welcome! Update: The streamgraph now accepts parameterized URLs for easier sharing of individual visualizations. Check out the EC-TEL 2011 stream, or a chart of the RDSRP’11 morning session.